Friday night at Metropolitan Wargamers in Park Slope, Brooklyn had a decent crowd of six of us collected in the back with a few other people up front continuing play of a multi-week and fairly dense American Civil War battle. Coming to agreement on an ad hoc game together for a half-dozen guys is a challenge on its own, but we managed to settle on two games which are standbys at the club but pretty new to me. Produced in Denmark in 2005, King of Chicago takes place in the Prohibition-era Windy City where each player takes on the guise of gangster looking to rule the streets by creating and breaking alliances, building their empire and whacking the competition along the way. 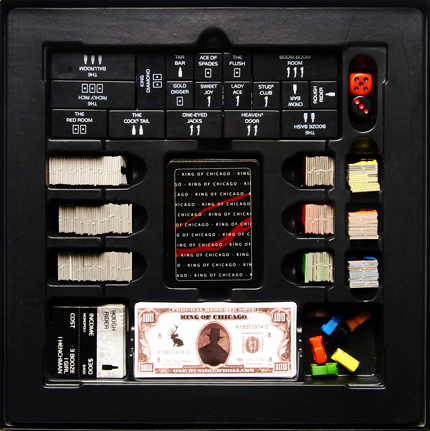 The game begins with each player owning a gangster, a car, $1000 and a few resources. Resources in the game are booze, henchman and girls, and additional resources are picked up in various landmarks spread throughout the city. Combinations of booze, henchmen and girls in your gang allows you to build bars, casinos and brothels which create income at the completion of four turns in each round of play. 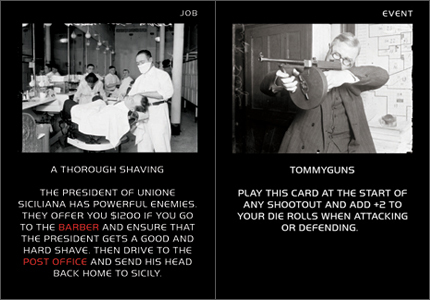 At the end of a round, players collect income, new gangsters are put into play and resources get set on the board. Bidding takes place for gangsters to add to your mob, gaining you bonuses of speed, income, protection and lethalness. Players also bid to bribe the cops, controlling them through the next round of play. 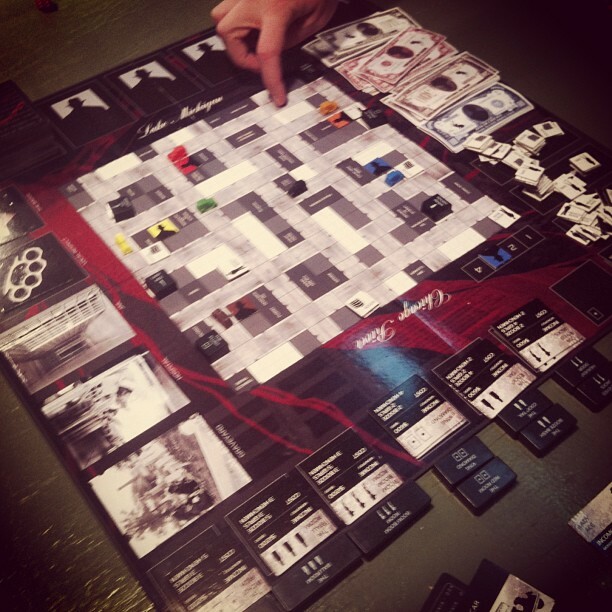 The game offers a lot of strategic play in how a player chooses to build their empire and also in managing relationships with the other mob bosses on the board. Drive-by shootings, shutting down competing businesses and sending the other guys to the hospital or the morgue makes for a lot of opportunity for deals to be struck and double-crosses to take place. Certain cards cause “events” like police raids to be played and others send players on “jobs” which net substantial sums of income. The player who quickly amasses ten points from money, businesses and influence wins the game. The game looks great with simple components and a wonderful collection of historic photos from the Chicago gangland days depicted on the cards. The many paths players can choose to build their mob empire adds significant replay value to the game. King of Chicago was released with a limited print run and can be hard to come by in the United States. However, for lovers of gangster movies and the period when the underworld ruled Chicago, chasing down a copy is well worth the effort. After a couple hours on the mean streets of Chicago, we had a seventh player show up. 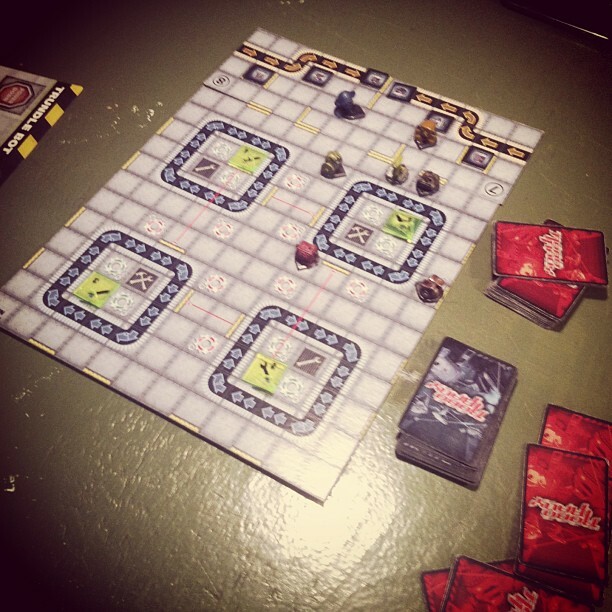 Our second game of the evening took us in a different direction with the hilariously chaotic RoboRally. The game was originally published by Wizards of the Coast way back in 1994 but was created a decade earlier by Richard Garfield who would go on to design the insanely-popular Magic: The Gathering card game. 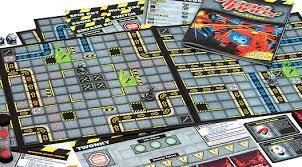 The game takes place on a factory floor with each player’s tiny robot attempting to navigate through a set number of flagged gates. This seemingly-simple mission is hampered by moving conveyor belts, rotating gears, solid walls and laser arrays spread throughout the factory. Robots controlled by other players also wreak havoc on your path by bumping into and zapping your robot with their lasers. At the beginning of each round, players draw up to nine cards each with directional actions such as left and right rotations, u-turns and movement backward and forward. Players secretly place their cards face down in front of them defining their robots’s moves for the round. In turn, players reveal each card and move their robots in order of card value and according to the movements selected. The fun and craziness comes in when well-thought plans quickly go awry as robots beginning bumping into each other and throwing each other off course. Just when you think you have a direct route neatly plotted out to a flagged gate space, some other robot (or two or three) ram straight into you, sending you wheeling off in some other direction. Lasers cause damage to your robot, reducing your movement choices in a round and only made better by spending a turn shut down repairing. Occupying repair spaces can also provide fixes for damage, and even special robot upgrade cards. The truly unlucky robots will find themselves bumped off the board, returning to their last starting point at the beginning of the next round. The more players who play only contributes to greater chaos on the board. Our late night seven-player game stretched to nearly two hours of mechanized madness until one player managed to get through a few gates and away from the crowd. My sad little robot, on the other hand, wound up spending the game unluckily bumping into his mechanized comrades and finished the game exactly where it started. RoboRally has won multiple awards, and its many versions and expansions have ensured its continued love among gamers for nearly two decades. After the cold-bloooded and calculating play in King of Chicago, it was great to end the night on a much more lighter but no less challenging game like Robo Rally.